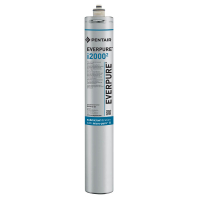 Everpure i2000² Water Filtration Cartridge (EV9612-22) Water Filter Cartridge - Genuine OEM Water FIltration Cartridge from Everpure - Replaces old part # 9612-21. This cartridge has new and improved Micro-Pure II media with AgION antimicrobial and Micro-Pure II media with AgION antimicrobial protection which inhibits any potential bacterial growth. The Precoat submicron technology reduces dirt and particles as small as 1/2 micron in size and possible health contaminants such as asbestos fibers and cryptosporidium and giardia cysts. The self-contained scale inhibitor feed reduces water-related ice machine problems caused by scale build-up from dirt and dissolved minerals.